It has often been assumed that William Turner of The Old Curiosity Shop was the father of the painter, as has been stated in several recent publications. However, records at the Gloucester Record Office prove that this William Turner was a schoolmaster, who had attended the Abbey School, and who was the son of James Turner, a tanner of St. Mary’s Lane. In 1788, when he was twenty-three, he married Esther Hayward, the daughter of Ann Hayward, a widow. They had a daughter, Esther, born in 1794. William Turner is mentioned in the minutes of the meetings regarding George III’s Paving Act. He was instructed to take down the shop front in St. Mary‘s Lane and build a round comer to the house1. He was listed in the rate books as the tenant of the property owned by Robert Vigor. We were unable to discover where William Turner taught. Was it at the Abbey School, where he had been a pupil? Or at Mr. Laight‘s school in nearby Church Street? Or was the very large property where he lived one of the several Tewkesbury Academies? There were no records of his death. or that of any member of his family. 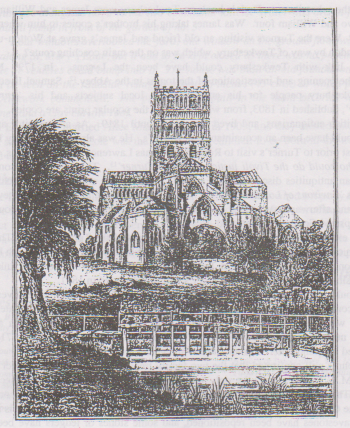 W.North’s book on Tewkesbury was published in 1885. It gives a very good description of a walk down St. Mary’s Lane, written by Henry Paget Moore and his brother Frederick. 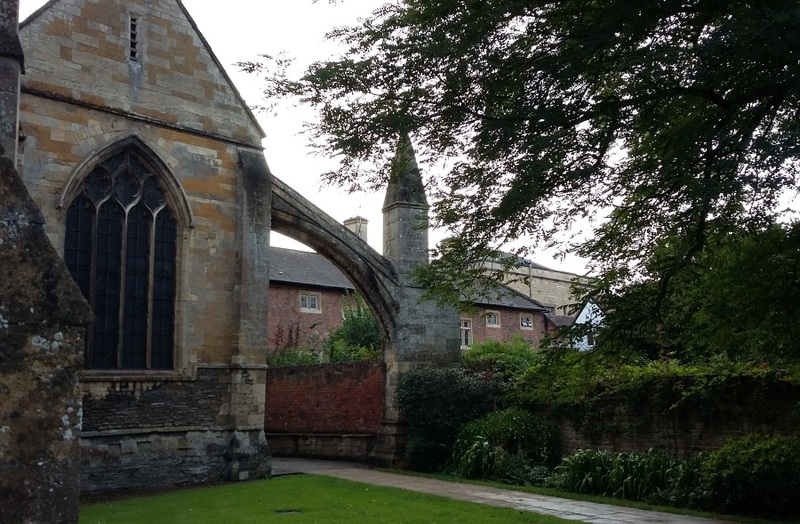 The brothers were pillars of the community and were greatly respected in Gloucestershire. They were founder members of the Bristol and Gloucestershire Archaeological Society, which published their papers on Tewkesbury in its first volume. "The dwelling at the corner of St. Mary’s Lane nearest the Hop-pole Hotel, at the present time known as The Old Curiosity Shop, is curious. From this point a good view is obtained of an ancient half-timbered building in the lane, used as a warehouse and offices for a Chemical Works and Cattle food Manufactory. In St. Mary's Lane, on the left-hand side, and next to a blank wall, is a house which once belonged to JM.W.Turner, RA. It had formerly belonged to his father, who may have once lived in it. The names of both Turner and his father were on the voters' lists of the latter part of the last century and the early part of the present as owners of a burgage in Tewkesbury." The voters’ lists cannot be found, so there is nothing to support the Moore brothers’ claim that Turner and his father lived in Tewkesbury. "Immediately beyond (The Hop Pole Royal Hotel) is the Old Curiosity Shop, at the corner of St. Mary’s Lane, and on the other side of the lane is a house with a curious vaulted cellar underneath both it and a part of the road. In this cellar are strewn, metaphorically, the bodies of archaeological commentators who have perished in the vain attempt to explain its mysteries....the visitor may explore them by permission of the occupier. On the left-hand side of St. Mary’s Lane. into which we will now turn, there is a house once owned by the great English landscape painter, JM.W.Turner, whom Tewkesbury once counted among its burgesses, and, thanks to his genius and Mr.Ruskin's advocacy and style, one of the most famous names upon the roll." This seems to confirm that Turner and his father had been to Tewkesbury, but no evidence is quoted. A watercolour by Turner, purchased by George Healing at Christie‘s sale on the 25th. February 1929, hung in the Abbey until 1968, when it was removed for safekeeping. The painting is catalogued in Andrew Wilton's Book, ‘JM.W.Turner, His Art and Life’ 2. It is a watercolour over pencil, signed ‘Turner' in the lower centre. It shows the Town Jail (Bell Tower), with the Abbey in the background, and is dated c. 1794. No provenance for the painting was given at the Christie's sale; more research is being carried out to try to identify the previous owner, and to ascertain whether Turner painted it as a commission. The Curator of the Tate Gallery proved very helpful. He provided copies of four sketches from Tumer’s sketchbook, all of the Abbey and its surrounding buildings, which were drawn in 1793. The sketches show Tumer’s skill as a draughtsman, and are architecturally accurate, as were many of his earlier works. Turner executed Ely Cathedral in 1797 for Dr. Yorke, the Bishop of Ely, a masterpiece with the sun shining through the Minster’s windows. Dr. Yorke was the husband of Mary Yorke of Forthampton Court (see T.H.S. Bulletins I & 11). None of the biographies of Turner we consulted mentioned Tewkesbury, but little is said about his travels in the West Midlands, and he left many pictures of Hereford, Worcester and the surrounding areas. Turner wrote very little, for his sketchbooks were his diaries and the record of his travels. No poll books for this period are extant, but this is not surprising, as M.P. 's could be elected by a show of hands. We accepted that Frederick Moore had seen the Turners’ names on the voters’ lists, and examined the burgage known as Turners Court. In living memory there used to be a house at the end of the Court, where the garden of No. 3 is today. Until recently there were five houses in Turners Court, so the end one next to the wall along St. Mary’s Lane would have been the one mentioned by Moore as the home of the great painter. The house at the other end which abuts Church Street was occupied by William Turner. a stocking weaver, his wife and two daughters; they are all buried in the Old Baptist Chapel graveyard. This house has erroneously been called ‘Craik House‘. Mrs. Craik never stayed in Tewkesbury; she paid a short visit prior to writing ‘John Halifax, Gentleman’, and many years later she visited as an old lady just prior to her death.3 At the time of her visit William Turner the stocking weaver was still living in the house. Edward Lascelles, later Lord Harewood, was one of Turner’s patrons, as is shown in the North of England Sketchbook, where Turner lists commissions for Mr. Lascelles of Harewood and of Kirkstall; most of the pictures are of Harewood House, dated 1798, except one of Kirkstall Abbey, dated 1797. In those days the young Turner would have been worth many thousands of pounds from his rich benefactors. As a family, they were notoriously mean, but the cost of the property would have been but a drop in the ocean to them. Perhaps this was just cheap accommodation which they meant to sell when they moved on. The only other plausible explanation would be that the burgage was in lieu of a fee for a painting or paintings. In Turner’s South Wales sketchbook4, in use in 1795, is the note, 'order of drawings for Lord Viscount Malden, Hampton Court in Herefordshire.’ Viscount Malden became the fifth Earl of Essex in 1799. The Earls of Essex were landowners in Gloucestershire, and two were Freemen in 1699 and 1721. The Earl of Essex built the brick bridge over the Swilgate in Gander Lane to replace the wooden Priests Bridge, "for the benefit of my Tenants". It is thought that the wooden bridge remained alongside the brick bridge for a short time, until it was demolished through need of repair. The pictures painted by Turner remained with the Earl and are now in the Whitworth Art Gallery at the University of Manchester. Thus, Turner certainly came to Tewkesbury, but were there other reasons for the visit? "The Rev. James Tattersall AM. had the Vicarage presented to him on the resignation of Mr. Evanson in l777, and he retained it until his premature death in 1791. He was the third son of the Rev. James Tattersall, rector of St. Paul’s, Covent Garden and of Streatham, Surrey, by Dorothy, daughter of William de Chair and sister of the Rev. Dr. John de Chair, rector of Little Risington, Gloucestershire. While on a visit to his brother, the Rev. William de Chair T attersall at Wotton-under-Edge, Gloucestershire, he was thrown from his horse and dragged a considerable way with his foot hanging in the stirrup, by which accident several of his ribs were broken, and he was otherwise so much bruised, that he expired in about an hour afterwards. He was buried at Wotton, where the following well-merited tribute of affection has been placed to perpetuate his worth: 'Sacred to the memory of the Rev. James Tattersall, AM., Vicar of T ewkesbury, who died by a fall from his horse, May the 9th., 1791, aged 38 years. Strength of judgement and sweetness of disposition he received from nature; to these he added the support of sound religious principles; and this union of good qualities, with the best acquirements, produced an amiable character, and an exemplary life. His brothers the rev. John T attersall, and the Rev. William de Chair Tattersall (Vicar of this parish), impressed with the deepest sorrow for his loss, and impelled by the sincerest afiection and gratitude, have caused this monument to be erected.’ Mr. Tattersall’s eldest brother, John, was Vicar of Harewood, Yorkshire, and a king’s chaplain; his brother William was also a king’s chaplain, rector of Westbourne, Sussex, and vicar of Wotton-under-Edge, Gloucestershire for up to of fifty years, and died March 26 1829." The Turners may have known the family, as the Rev. Tattersall, Rector of St. Paul’s, baptised Turner the painter with the names Joseph Mallord William Turner. His maternal great-grandfather’s name was Mallard, but the name remained Mallord. Turner’s parents were married there on 29th. August 1773 by the curate, Ezekiel Nance. The rector’s three sons were brought up in the same area of London, and may have attended the same school as Turner. Turner’s father, a hairdresser, periwig maker and powderer may have attended to the Rector of St. Paul‘s. Two of the subscribers to Dyde’s book on Tewkesbury were James and William Tattersall, James taking two and William four. Was James taking his brother’s copies to him when he had his tragic accident? Were the Turners visiting an old friend and James’s grave at Wotton-under-Edge, returning to London by way of Tewkesbury, which was on the main coaching route? Another link with Tewkesbury could have been the Lysons. In 1795 Mr. Lysons superintended the opening and investigation of the tombs in the Abbey.7 Samuel Lysons is better known to Tewkesbury people for his engravings of local subjects and his ‘Antiquities of Gloucestershire’, published in 1803, from which most of the popular prints are copied. He was one of the great British antiquarians, and lived from 1763 until 1819. As an exhibitor at the Royal Academy he would have been an acquaintance of Turner’s. 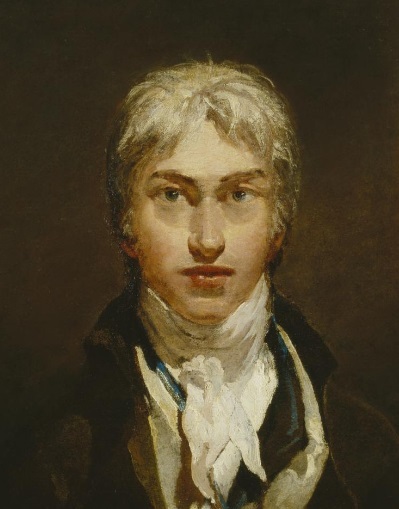 He was also the Antiquary Professor at the R.A., and just prior to Turner’s visit to Rome Sir Thomas Lawrence wrote to Lysons, saying, ‘the only persons who could do the Tivoli justice would be Turner’ 8. This refers to Lysons’ work on figures of Roman antiquities discovered in England, 1801-17. He also produced etchings for his brother Daniel’s ‘Environs of London 1792-96’. Daniel was a curate at Mortlake, Putney, as well as a topographer, and afterwards succeeded to their late father’s living at Rodmarton, Gloucestershire. He died at Hempstead Court on January 3rd.,1834. We also examined the family trees and the family ties of the Turner family. This involved the investigation of all Turners and Knights living in the Tewkesbury area for links with Devonshire, Bath and London. There were no direct links with the elder relatives; the only links could be through the cousins who were alive when Turner’s will was disputed in 1851. There could be a possible link through Uncle John of Barnstaple, his relatives, sons and daughters. It could have been early relatives if the Turner family did not originate in Devon. However proof was found in the Devon Record Office that the Turners were born and bred in Devon, mostly near and around South Molton. Great-grandfather was born in 1717 in South Molton, followed by grandfather. Tumer’s father and uncles were all born there. Uncle John’s will confirmed that the two family trees were correct with respect to the later claimants to J.M.W.Turner’s will, the only tenuous link with Tewkesbury being second cousin John’s family. They fitted with those buried at the Baptist Chapel. Unfortunately, records of births and deaths in the Chapel are scant, and the only volume in Gloucester Record Office is incomplete. Many of the gravestones have been repositioned, and some stones or ledgers have been removed from the chapel in Barton Street. The wills of all the Tewkesbury Turners back to the sixteenth century were examined in case there were any links with Devon. The Poll books before and after Turner’s visit were examined, with rent books, poor rate books and the later census returns to see whether there were any people of an age to have had a link with Turner on his visit. We also tried to discover if anyone in Tewkesbury came into money at the time of Tumer’s will. Knight was Turner’s grandmother’s maiden name; were there any beneficiaries in the family other than Turner’s father? The area where the Turners bought their burgage was in the centre of the tanning industry of Tewkesbury. 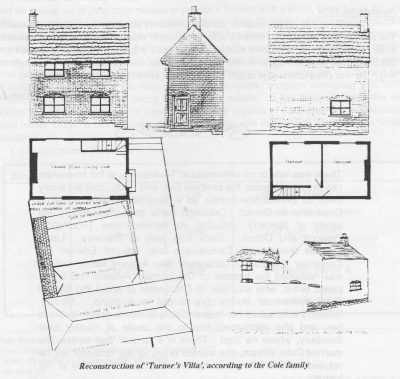 The Tanner’s Arms was in St. Mary’s Lane, where the building still stands, though now used as a dwelling. There are tanners’ pits and the remains of the drying sheds. All the records in Gloucester Record Office covering Tewkesbury, anything and everything that could in the slightest way relate to Turners, Knights, Church Street and St. Mary’s Lane were scanned, and we checked to see if any of the Bamstaple Turners had been apprenticed in Tewkesbury. There are very few references to the name Turner in any of the records, but those that were found have been listed, with appropriate comments. The marriages in Tewkesbury of male and female Turners and Knights are also listed. Many people named Turner have lived in Tewkesbury, but there is very little about them in the Tewkesbury Borough records held at the Gloucester Record Office. 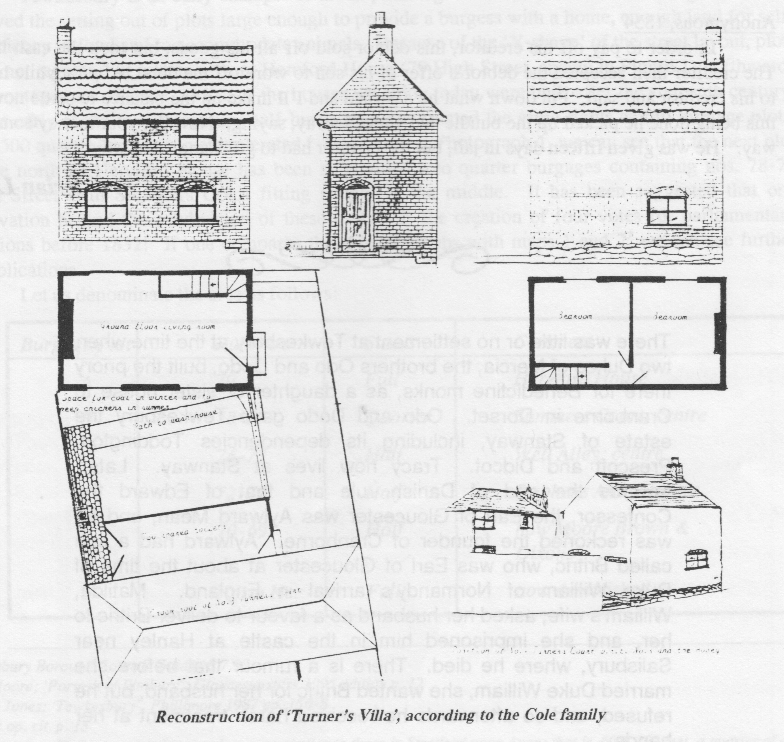 A section here has been moved to the page on Turner's Court called "Turner's Villa". There is no evidence still extant to prove that J .M.W.Tumer owned property in Tewkesbury. However, we have accepted the statement of the highly reputable Moore brothers, and believe that he did in fact own the burgage in Turners Court. 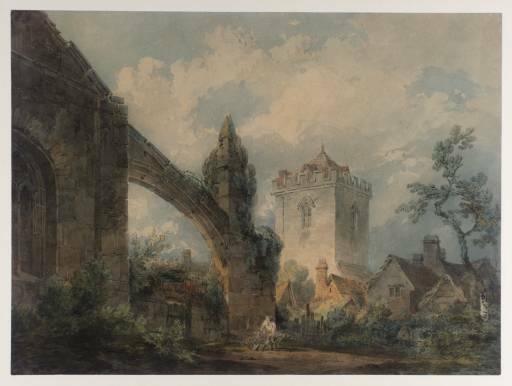 As to Dickens, in the absence of any substantive evidence of a visit, it appears more likely that he heard of Tewkesbury’s remarkable buildings from his friend Turner, whose artist’s eye would have enabled him to give a graphic description. Paving Act Commissioners Minutes G.R.O.